This shot was taken near The Sundance Kid’s Place off of Utah’s Alpine Loop scenic drive which leads to Cascade Springs. 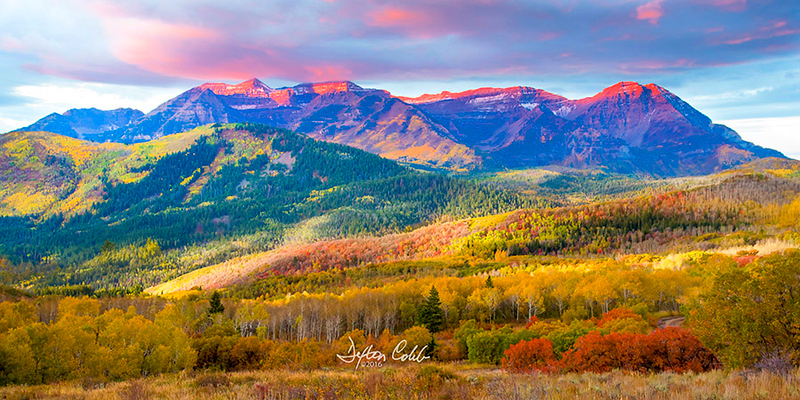 Mt Timpanogos is the prominent feature in the area and, it seems, it can be tough to compose a shot without it. This is a beautiful part of the country and can be a real treat to see in the fall. We were on this Forest Road in the dark, in an effort to gain a little elevation to compose an expansive landscape shot at sunrise, when we encountered a group of hunters hobnobbing around a campfire. We selected a spot to shoot from and enjoyed a colorful sunrise which really only lasted about 2 minutes. Oh but what marvelous couple of minutes! A good view of Mt Timpanogos framed by a wonderful fall palate.